Ueda Kichibei (Kichizaemon VIII). 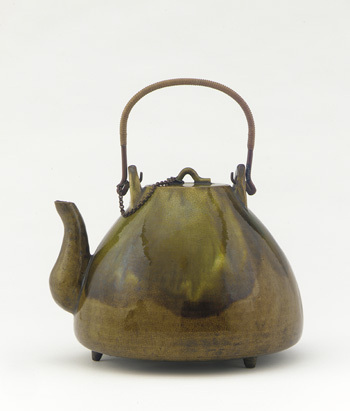 "Minato ware tea pot," earthenware with lead glaze; copper chain, copper and rattan handle, mid-19th century. (Freer Gallery, Smithsonian Museums, Washington, DC). Freer/Sackler, the Smithsonian's Museums of Asian Art. Smithsonian Institution. Web. 21 August 2013. Increasingly, museums provide access to major portions of their collections online and are therefore rich sources of images. It is also worth remembering that some – the Met, the Louvre, the National Gallery (U.S. and U.K.), the Tate, the British Museum, and many others – are rich sources of information on provenance, exhibition history, artist biography, and bibliography as well. Some museums, such as the Getty, allow their images to be freely used; while this is a growing trend, most museums require permission and sometimes a fee to use their images and most impose limitations on how their images may be used. Be sure to check museum websites for Rights and Reproductions information on copyright and how to cite their collections in addition to copyright and citation information found here or elsewhere. The museum sites listed below are just a few of many possibilities. Search Google Images and ArtCyclopedia to find more, or choose your favorite museums and investigate their websites. ArtCyclopedia’s mission is “to become the definitive and most effective guide to museum-quality fine art on the Internet” and it includes entries for “most well-known artists.” A search for an artist will bring up links to images of that artist’s work on museum websites and in image archives, and will also link to articles and reference sites. The Museum’s entire database to date can be searched. New records and images are being added every week. When complete the database will contain a record of every object in the Museum collection, with associated conservation and scientific reports where available. The Alte Pinakothek is one of the oldest galleries in the world, housing a world-reknowned collection of Old Master paintings from the fourteenth to the eighteenth century. The Neue Pinakothek covers nineteenth-century art and the recently opened Pinakothek der Moderne exhibits modern art. Search the Getty's collections, or browse by artist, by object type/medium (furniture, paintings, drawings, sculpture, etc), or by theme/topic. Images on the Getty website are available for download at no charge as part of the Getty's Open Content Program, which makes available all digital images to which the Getty holds the rights. “Catalog of the collections of the museums of France, available via the internet.” Includes the holdings of about 140 museums with collections in archaeology, the fine arts, ethnology, history, and the sciences and technology. An exhaustive catalogue of the museum's 140,000 works on paper, by some 4,500 artists; it provides access to the drawings, cartoons, pastels, and miniatures listed in the original handwritten inventories of the Cabinet des Dessins of the Musée du Louvre and the Musée d'Orsay. Choose "Oeuvres" and click "Recherche Multicritère" to search by inventory number, artist, school, date, subject, or technique, or in the context of the history of the collection. Information about the artists (in French) is also provided (lives, works, style). Includes images. Search the Met's collection by Who (artist, maker, culture), What (technique or material), Where (geographic location), When (era or date), or by museum department. Click the "Browse highlights" tab for a moving strip of 1400+ selected works. Click letters to see complete lists of the works of every artist in the collection. Click links on the sidebar to get a collection overview, browse by century, see the painting of the month, and other slices of the National Gallery's collection of paintings of the Western world from late Medieval masters to the French Impressionists. The NGA site is not only a rich source of images from their extensive collection; it is also a rich source of information, as records for each work include bibliography, provenance, exhibition history, and any inscriptions. Search the Rijksmuseum's collections or browse by artist, subject, style, or highlights. Click links to "more details" to find exhibition histories, bibliographies, and information on materiasl and techniques. The world’s largest research and museum complex, with 19 museums and galleries, the National Zoological Park, and various research stations. Collections and other online resources are correspondingly extensive; the website repays concentrated searching and browsing. Founded by Catherine the Great, the Hermitage houses a spectacular collection of world art spanning the years from the Stone Age to the early 20th century. The museum’s focal point is Western European art. Search the Tate's collection of British art from 1500 to the present and international modern and contemporary art. Browse by artist, category (painting, sculpture, work on paper, etc. ), style or "ism," subject, gallery, and context (new acquisition, gift, collection highlight). A vast quantity of digital images have been made available for research purposes online and within the British Library. The collections are truly diverse, encompassing prints, drawings, maps, art works and photographs, as well as illuminated manuscripts, digitised bookbindings and philatelic collections. Click this link for a selection of collections available for research purposes. One of the most important digital libraries available for free via the internet, Gallica provides access to printed documents, including French books, newspapers, and magazines from the 17th to the 20th century, manuscripts, sound and other media, and archival documents, maps, and plans. Includes many images from (for example) illustrated books and journals, archival documents, and manuscripts. Contains catalog records and digital images representing a rich cross-section of still pictures held by the Prints & Photographs Division and, in some cases, other units of the Library of Congress. The collections of the Prints & Photographs Division include photographs, fine and popular prints and drawings, posters, and architectural and engineering drawings. While international in scope, the collections are particularly rich in materials produced in, or documenting the history of, the United States and the lives, interests and achievements of the American people. The Met's digital collections include Met publications from 1869 - 1974, rare books from the library's collections, items on bookbinding and book collecting, texts, images, and fashion plates from the Costume Institute, Japanese illustrated books, Knoedler & Co. exhibition catalogs and Macbeth Gallery exhibition catalogs, rare manuscripts, rare books published in Imperial and early Soviet Russia, trade catalogs from the 18th century to the present, and much more. provides free and open access to over 800,000 images digitized from the The New York Public Library’s vast collections, including illuminated manuscripts, historical maps, vintage posters, rare prints, photographs and more. The cross-collection search retrieves results from over 500,000 images in selected Library Digital Collections. These collections include the Yale Visual Resources Collection, Beinecke Rare Book and Manuscript Library Digital Images Online and the Yale Department of Classics Collection.